NOFX /ˌnɵɛfˈɛks/ are an American punk rock band from Berkeley, California (later relocating to Los Angeles). The band was formed in 1983 by vocalist/bassist Fat Mike and guitarist Eric Melvin. Drummer Erik Sandinjoined NOFX shortly after. In 1991, El Hefe joined to play lead guitar and trumpet, rounding out the current line-up. The band rose to popularity with their fifth studio album Punk in Drublic (1994). NOFX's mainstream success was signified by a growing interest in punk rock during the 1990s, but unlike many of their contemporaries, they have never been signed to a major label. NOFX has released twelve studio albums, fifteen extended plays and a number of seven-inch singles. Their latest studio album, Self Entitled, was released on September 11, 2012. The group has sold over 6 million records worldwide, making them one of the most successful independent bands of all time. 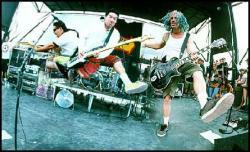 The band also broadcast their own show on Fuse TV entitled NOFX: Backstage Passport.